As an extra added bonus this year we have a colorwork Christmas Stocking from the Queen of Colorwork herself Anna Zilboorg. What I like most about these is their fun and whimsical quality. They have a Seuss-like quality that makes me smile every time I see them. I think the Grinch himself would be hard pressed not to be enchanted by these. 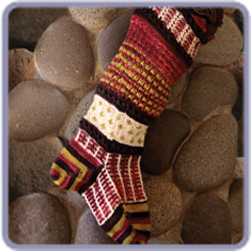 So come all you Cindy Lou's knit your very own Anna stockings to hang on the hearth for the holidays.